Good Evening CamaroNews Fans! 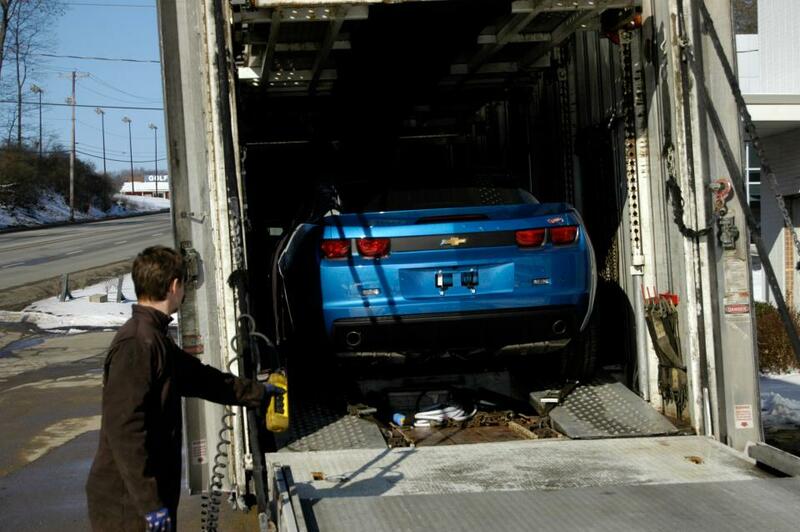 Back on February 8th we were the first to post about the very first Hot Wheels Camaro. 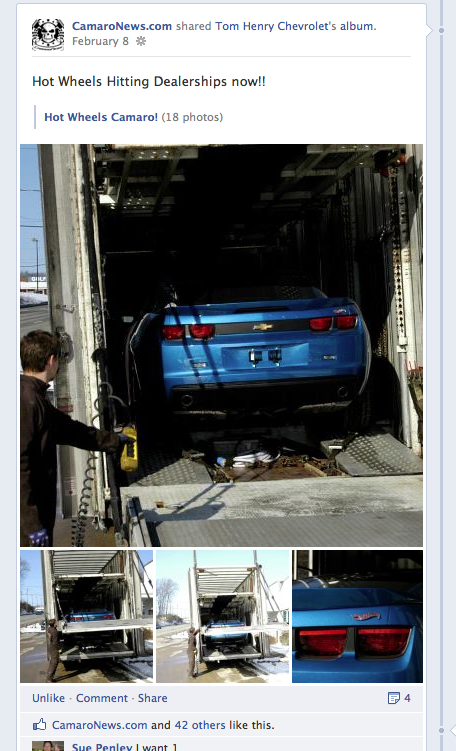 Looks like it has been delivered to a customer and that customer is very happy. 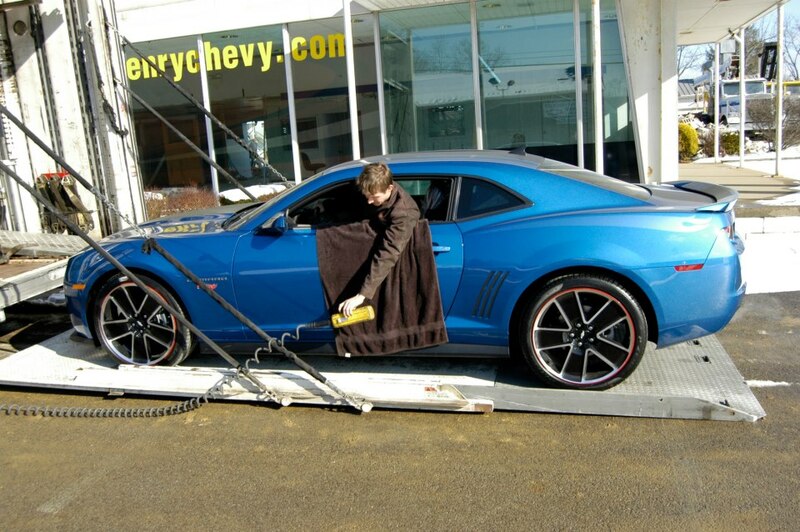 The Hot Wheels Camaro was delivered to Tom Henry Chevrolet in PA. This is one awesome car, Remember keep it locked here at CamaroNews as we always have the cutting edge news first! LAS VEGAS – The dream of millions of Hot Wheels® fans of all ages will come when the Camaro Hot Wheels® Edition arrives at Chevrolet dealerships early next year. It’s the first time a full-size, production Hot Wheels® car has been offered for sale by any manufacturer.Blister packaging and orange race track not included.“Millions of us grew up playing with Hot Wheels,” said Chris Perry, vice president of Chevrolet Marketing. “Offering a special production model of the Camaro Hot Wheels is an opportunity to bring those memories to life, for kids of all ages.”The Camaro Hot Wheels® Edition debuted today at the SEMA Show, in Las Vegas. A special run of the Camaro Hot Wheels® Edition will be produced in the first quarter of 2013 – and like the collectable toys on which it is based – when they’re gone, they’re gone.“It’s been nearly 20 years since I started designing cars for Hot Wheels and I have yet to drive one home,” said Felix Holst, vice president of creative for the Mattel Wheels Division. “Personally, I can’t wait to open the doors and see the Hot Wheels Camaro sitting in the garage.”The appearance of the Camaro Hot Wheels® Edition echoes the cues that Hot Wheels enthusiasts recognize, including a vibrant, graphics-accented metallic paint scheme and even the red-lined wheels. The result is instantly recognizable as a Hot Wheels. Hot Wheels grille and decklid logos. On the inside, a black leather-trimmed interior is accented with red and black seat stitching with the Hot Wheels logo embroidered on the front seats. The instrument panel and door inserts are black, with the Hot Wheels-style flame decal on each door. Hot Wheels® Edition sill plates also distinguish the car, along with Camaro-logo premium floor mats with red edging. SS models feature a 6.2L V-8, which is offered in two iterations: the “L99” on automatic-equipped vehicles and the “LS3” on manual-equipped models. Horsepower for the L99 is 400 (298 kW) and torque is 410 lb.-ft. (556 Nm) – and it features fuel-saving Active Fuel Management. The LS3 develops 426 horsepower (318 kW) and 420 lb.-ft. (569 Nm) of torque. LT-based models feature the “LFX” 3.6L V-6 engine, with dual-overhead camshafts, variable valve timing and direct injection. It’s rated at 323 horsepower at 6,800 rpm. Chevrolet’s MyLink infotainment system is standard on the Camaro Hot Wheels® Edition. Its color touch radio, with a seven-inch touch screen, also can be paired with an available in-dash GPS navigation system. The color touch radio with MyLink enables a higher level of in-vehicle wireless connectivity and customized infotainment options, while building on the safety and security of OnStar. It seamlessly integrates online services such as Pandora® internet radio and Stitcher SmartRadio® using hands-free voice and touch-screen controls via Bluetooth-enabled phones. FACT: The original Custom Camaro 1:64-scale toy from 1968 was one of the original16 Hot Wheels issued and remains one of the most valuable Hot Wheels toys among collectors. 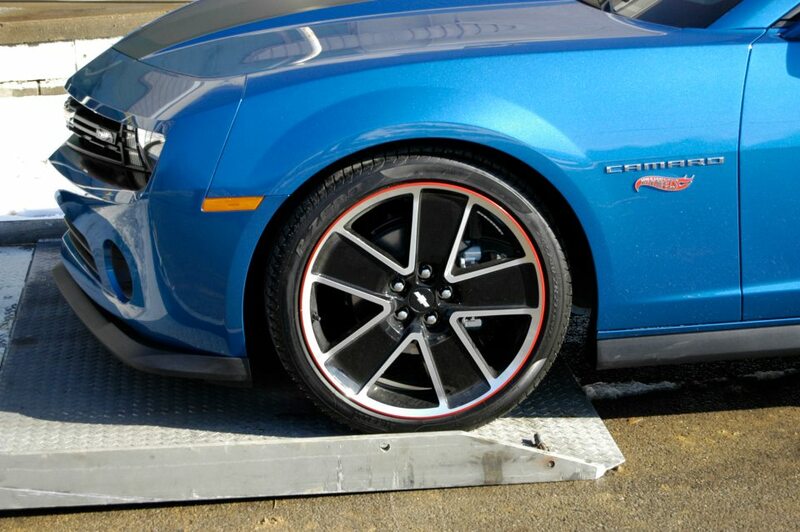 ZL1 Pace Car Sports New Wheels & Paint: Are These 2014 ZL1 Options?